The Farinas / Formative Years (1962–1967) Jim King (lead vocals, harp) (born Alec Woodburn, Tuesday, May 5, 1942, Kettering, Northamptonshire, England died Monday, February 6, 2012, Middlewich, Cheshire, England), Harry Ovenall (drums) (born Richard Harry Ovenall, Sunday, September 12, 1943, Thorpe Hall, Peterborough, Cambridgeshire, England), Charlie ‘Johnny’ Whitney (lead guitar, vocals) (born Richard John Whitney, Saturday, June 24, 1944, Skipton, North Yorkshire, England), Tim Kirchin (bass) (born Timothy Kirchin, ca. 1944, Birstall, Leicestershire, England died ca. 2000), Terry Cowlishaw (drums) (a few gigs) (born Terence Cowlishaw, Wednesday, August 27, 1941, Midway, Swandlincote, South Derbyshire, England), Ric Grech (bass, lead vocals) (born Richard Roman Grechko, Friday, November 1, 1946, Bordeaux, France died Saturday, March 17, 1990, Leicester General Hospital, Leicester, Leicestershire, England, of kidney failure), Roger Chapman (lead vocals) (born Roger Maxwell Chapman, April 8, 1942, Leicester, Leicestershire, England). Soul-pop outfit James King and the Farinas were formed in Late 1962 at Leicester Art College, Leicester, Leicestershire by Jim King on lead vocals and Charlie Whitney on lead guitar, vocals, with Tim Kirchin on bass and Harry Ovenall on drums. Whitney who had been born in North Yorkshire was the son of show business parents, who when it was time for him to go to school, moved to outside of Leicester when Whitney was five in 1949. Whitney had met harp playing vocalist King and drummer Ovenall at Leicester Art College all on a foundation course. Also there was drummer Cowlishaw, who was a year ahead of Ovenall and studying Fine Arts. He would dep for Ovenall occasionally in the early days, as Ovenall was also in another couple of bands in Peterborough, The Teenbeats and The Monarchs. Ovenall started out in The Teenbeats, who had a line-up of Rod Hurricane on lead vocals (born David Everett), Tiny B. Arthur on lead guitar (born Eric Bailey died ca. 1975), Jess T. Claymore on bass (born Colin Mitchell) and Harry J. Vincent (Ovenall) on drums. Then he was in The Monarchs that included Peter X on lead guitar, Buddy Lay on rhythm guitar, Dave X on bass and Ovenall on drums. While playing in this band he was also playing in James King and the Farinas, this is the when Cowlishaw would dep for him. This was mostly when Ovenall was not at Art College in the holidays or at weekends when he went home to Peterborough to play in The Monarchs. Ovenall and a friend would go with him to help carry his drums, which he would take on the train. As for Cowlishaw he was also drummer in a band called Unit Four Plus One while at Leicester Art College. Cowlishaw was a year ahead of Ovenall at Leicester Art College. There were three drummers living in the College Hostel. As for Whitney he was already playing lead guitar in a band called Tony Bart and the ReVels, who included Tony Bart on lead vocals (born Anthony Bartholomew), Rod Moore on bass (born Roderick Moore, ca. 1944 died 1962, A47, near, Leicester, Leicestershire), Pete Davies on rhythm guitar (born Peter Davies) and Harry Ovenall on drums. Later Bart left the band to do his own thing and Moore was sadly run over by a truck on the A47 outside Leicester at the side of the road, while at work. He worked for Leicester Council. Tim Kirchin replaced Moore. King took over the band and Ovenall came up with the new name The Farinas. He looked in a library book, putting his finger in it and coming up with the name from an Italian car designer. As for Bart he joined a band called The Strangers and later still a show band called The Moonstones that also included Cowlishaw on drums. In Late 1962 James King and the Farinas played their first gig at Leicester Art College, Leicester. In the early days, the band would play at The Corn Exchange and Il Rondo, both in Leicester. In around Late 1962 James King and the Farinas cut a demo, a rare acetate recording of ”All You Gotta Do,” ”Twist And Shout” and ”By By Johnny” at The Sound Studios at 41-49 London Road in Derby, Derbyshire. It was produced by Victor Buckland, owner of the studio. 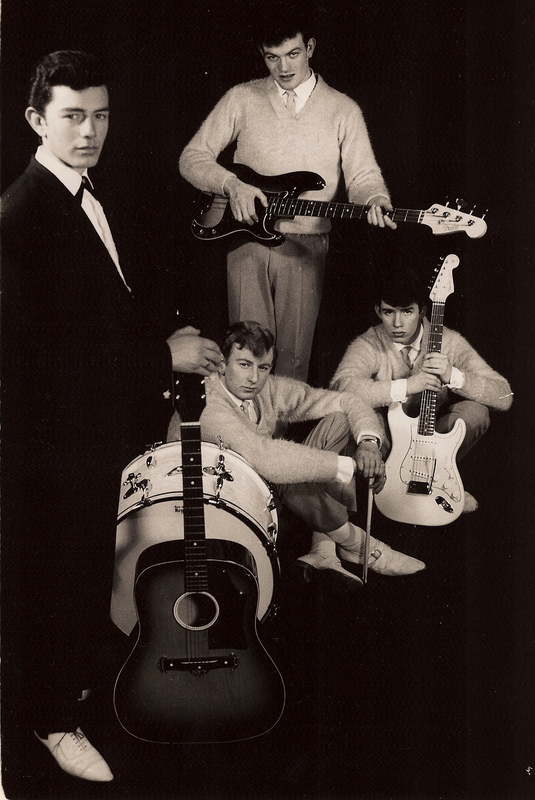 James King and the Farinas turned pro in April 1963, after all the band had left college and the group took little jobs to keep themselves going. Harry Ovenall worked at the Leicester TA Drill Hall, looking after the army trucks. As for Jim King, he worked at Lewis’ in Leicester. Not sure about the others. In 1965 the 21-year old Kirchin left the band. He then quit the music biz, got married and moved down to Brighton in East Sussex, where his wife came from. He was replaced by 19 year-old Ric Grech, who was of Ukrainian origin and had been born in France. He was educated at The Sacred Heart Primary School and The Corpus Christi RC School both in Leicester. Grech had played first violin in The Leicester Youth Symphony Orchestra and joined his first band The Berkely Squares, formed by guitarist Martin Osborn. Osborn had taught Grech to play guitar. He was also in a band with brother’s guitarist Ray Martinez and bassist Paul Martinez (born Paul Frank Martinez, Sunday, October 5, 1947, Leicester), Grech was later in a band called The Exciters with future Farinas lead vocalist Roger Chapman and guitarist Stuart Brown. When Chapman left this group he went to Germany with Danny Storm and the Strollers. As for Grech he joined James King and the Farinas. 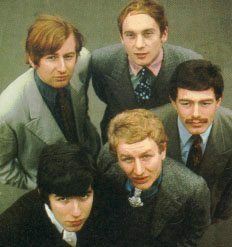 In 1966 James King and the Farinas became a five-piece when they were joined by 24 year-old lead vocalist Roger Chapman. He had been educated at Ellis Intermediate School in Leicester and had entered show business at 17 in 1959, the same year he made his first public appearance at The Palais De Dance in Leicester, which was with his first band The Rockin’ R’s? His second band was The Exciters with future James King and the Farinas bassist Ric Grech and guitarist Stuart Brown. He was later in The Strollers who backed singer Danny Storm (born David Hurran, 1944, Leicester, Leicestershire, UK), who had a hit in April 1962 with ”Honest I Do.” The original Strollers were Geoff Chalk, Tony Burnett and Colin Angel (b. Colin Wilsher), who backed Danny Storm in Southampton, Hampshire. The Strollers later included drummer Barney Peacock. Chapman went to Germany with Storm and the Strollers and on his return he joined The Farinas. Whitney had first met Chapman when he spoke to him at The Palais De Dance in Leicester in the early 60’s. Whitney had seen him sing once and he needed a singer for a gig, but he could not do it, but Chapman introduced him to another singer who could. In 1966 James King and the Farinas changed their name to The Roaring Sixties, which soon changed to Family in October 1966. The famous American record producer Kim Fowley (b. Kim Vincent Fowley, July 21, 1939, Red Bank, New Jersey, USA d. January 15, 2015, West Hollywood, California, USA) had suggested they call themselves The Family, as they regularly wore double-breasted suits in performances, giving themselves a Mafia appearance, a look they soon abandoned in favor of a more casual dress code. On Saturday, October 22, 1966 The Family played for the first time at the famous Cavern Club, 8 – 10 Mathew Street in Liverpool 2, Lancashire. According to Spencer Leigh’s book ”The Cavern” (SAF, 2008) ”One of the earliest appearances from Roger Chapman’s classic rock band, Family. On Wednesday, October 12, 1966 The Family played The Club A-GoGo in Percy Street, Newcastle-upon-Tyne, Northumbria for the first time. In September 1967 Family were signed to The Liberty Label, because of their outstanding concerts. Thanks to Jimmy Miller, Steve Winwood (born Stephen Lawrence Winwood, Wednesday, May 12, 1948, Handsworth, Birmingham, Warwickshire, UK), Dave Mason (born David Thomas Mason, Friday, May 10, 1946, Worcester, Worcestershire, UK), Jim Capaldi (b. Nicola James Capaldi, Wednesday, August 2, 1944, Worcester, Worcestershire, UK d. January 28, 2005, London, UK) and Chris Wood (b. Christopher Gordon Blandford Wood, Saturday, June 24, 1944, Quinton, Birmingham, Warwickshire, UK d. Tuesday, July 12, 1983, Queen Elizabeth Hospital, Edgbaston, Birmingham, West Midlands, of pneumonia), all members of Traffic, helped participated in the recording of their first single in September 1967 at Olympic Sound Studios, 117 Church Road, Barnes, South West London. Shortly after the recording of ”Scene Through The Eyes of A Lens” / ”Gypsy Woman,” and before it’s release Ovenall left in Late September 1967. Ovenall left as he voiced his concern over the bands movement away from their black musical roots, like Blues R & B and Soul. His concerns also included the role of the bands management John Gilbert. A group meeting was called, during which it was suggested Ovenall’s heart was no longer in the band and as a consequence he left Family. Contrary to several reports he was not asked to leave the band. So he was replaced by 20 year-old drummer Rob Townsend. Townsend spent his teenage years playing in a various Leicester groups such as, The Beatniks, Mid 60’s 6 piece group The Broodly Hoo and Legay, who were influenced by Tamla Motown. Legay was formed in 1965 with a line-up of Rod Read on guitar, vocals (born Robert Read), Robin Pizer on guitar, vocals, Dave ‘Mac’ Macarthy on bass, vocals, John Knapp on vocals, guitar, organ and Legay Rogers on drums (born ? died December 1997). Legay made their début at The Casino Ballroom at the top of London Road in Leicester. Later on they were joined by Townsend, who replaced Rogers. On Tuesday, March 7, 1967 Legay played The Casino Ballroom, Leicester. On Saturday, June 17, 1967 Legay supported Family at The Marquee, 90 Wardour Street, Soho, West London. After Townsend left in September 1967 to join Family, he was replaced by 16 year-old drummer Dave ‘Moth’ Smith (born David Smith, Saturday, July 21, 1951, Leicester, Leicestershire, UK), who later played in Diesel Park West. On Saturday, February 24, 1968 Legay supported The Gods at The Marquee, Soho, West London. On Saturday, March 15, 1969 Legay played at Loughborough University, Loughborough, Lancashire, with The Moody Blues, Van de Graff Generator. In March 1969 Legay changed their name to Gypsy, with a line-up of Knapp, Pizer, Smith, Macarthy and new member guitarist Roy Martinez, who replaced Read. One of Gypsy’s their first gigs was supporting Led Zeppelin on Tuesday, April 1, 1969 at The Klooks Kleek, The Railway Hotel, 100 West End Lane, West Hampstead, North West London. The band played the Isle of Wight Festival, Wooton, Isle of Wight on Saturday, August 30, 1969, along with Family and others. Gypsy also played at The Whiskey A’Go Go, West Hollywood, CA, USA on Wednesday, November 26, Thursday, November 27, Friday, November 28, Saturday, November 29 and Sunday, November 30, 1969. They also played at Afan Lido Leisure Centre, Port Talbot, South Wales on Saturday, May 23, 1970 and at The Atlanta International Pop Festival 1970, Middle George Raceway, Byron, GA, USA on Friday, July 3, 1970. Many thanks to John H. Warburg and Nick Warburton for their extensive research and information presented on this page. Advertised on the poster as Philips Recording Artists The Farinas Midlands Top R & B Group. Advertised on the poster as Marathon Dance On! Today Easter Monday 3 p.m.-1 a.m. 10 Hours Non-Stop to 5 Fabulous Bands – plus Tony Esquire Licensed Bar till 12 The Farinas Broodly Hoo Invaders (Midland Beat Winners 1966) Brian Henry and the Saints, Pat Gissane Showband. Advertised on the poster as Saturday, April 16th Burlesque 158 Humberstone Street 10 p.m.-All-Night Soul- 10 a.m. With Leicester’s Top Farinas Broodly Hoo Mozzeltoff. Advertised on the poster as Jack Hardy and Nick Tiernan presents tomorrow Tuesday The Farinas The Matadors Inter-City Session. Advertised on the poster as P.S. Promotions Present New Sunday Scene Casino Every Sunday Now Open From 6.30pm This Sunday Farinas Smokestacks Facts. Advertised on the poster as The Burlesque 158 Humberstone Street 10 p.m. Sat. 14 May 10 a.m. All-Night Soul with The Midlands Top Soul Band The Farinas Plus Jelly. Advertised on the poster as The County Arms, Blaby Tonight – Tuesday Everything ”Goes” with another Inter-City Beat Scene with The Matadors (Coventry) The Farinas (Leicester). Advertised on the poster as Now Open From 8 p.m. till 2 p. m. The Latin Quarter, 28 Belgrave Square. Advertised on the poster as 8 p.m. to Midnight Gigantic Marquee : Dance Floor Free Car Park : Licensed Bar Admission 7/6. Advertised on the poster as The New Scene (Corn Exchange) Tonight 8.0-11.30 Hi Li Hi Lo Alan Price Set and Farinas + Free L.P.’s from Barmy Barry. Billed as the Roaring Sixties unless otherwise noted. Advertised on the poster as 10 p.m. Saturday 10 a.m. All Night Soul with Two Bands Sands Plus Roaring 60’s Plus Tony Esquire. Advertised on the poster as The New Scene, Corn Exchange Tomorrow By Public Demand The Roaring 60’s plus Tony Esquire Show and The Warlocks. as The Roaring Sixties but advertised as Family.